4.4 x 2.4 x 1.1 in. The Samsung EX2F packs one of the fastest lenses in the compact camera field plus advanced photographic controls and RAW capture which should make it a no-brainer as a handy, everyday sidekick. However, the EX2F has some quirks and shortcomings that not all photographers may like, including limited telephoto reach and inconsistent JPEG captures. Overall though, it stacks up well against its peers. Good (modern, not retro!) looks and solid build; f/1.4 Schneider-Kreuznach lens starting at a wide 24mm equivalent with excellent low-light capabilities; Advanced photographic controls and RAW capture; 3-inch, articulated AMOLED monitor. Limited telephoto reach; Inconsistent and disappointing JPEG images; Some corner blurring at both wide and tele; Noise suppression too strong at ISO 800 and above, robbing detail. The magnesium-bodied Samsung EX2F started shipping in August 2012 with pricing set at US$499.99, about $50 more than the TL500/EX1 when it was introduced. The Samsung EX2F was mostly a pleasant surprise for me. It aspires to be the compact camera an enthusiast photographer would never find themselves without -- a handy, everyday sidekick -- and largely succeeds, albeit with some quirks, limitations and outright annoyances that I found during my time with it. I found so many features an avid photographer will love. Such as RAW captures. And a hot shoe (not to mention a built-in pop-up flash). And that f/1.4 aperture. And PASM on the mode dial. And an articulated AMOLED screen. And even a detail as small as the rotating strap eyelets on the sides of the camera. Even the EX2F's options have a flare for serious photography or videography. How about an optional optical viewfinder or stereo microphone in that accessory shoe? Or optional conversion lenses you can screw onto the body over that built-in lens? Not necessary for most, but there are some shooters out there who'd know what to do with those. Samsung calls the EX2F a Smart Camera -- and not just for its WiFi features -- and there are some intriguing exposure modes hidden in its menu system. While some of them fall into the creative category (like the Miniature or Vignetting smart filters), others also show some photographic intelligence (like a neutral density filter). Not all the surprises were pluses, though. And not all of them were of a photographic nature. Overview. 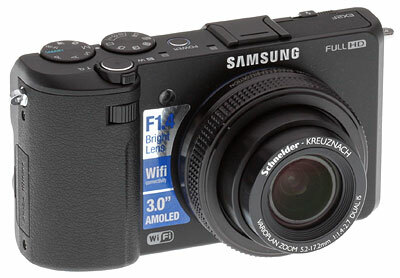 The enthusiast pocket camera Samsung EX2F is the successor to the TL500 (also known as the EX1 in some markets), offering a number of significant improvements -- as well as a higher price tag. The Samsung EX2F design is based on a 1/1.7"-type 12-megapixel BSI CMOS image sensor, rather than the 10-megapixel CCD used in the TL500. 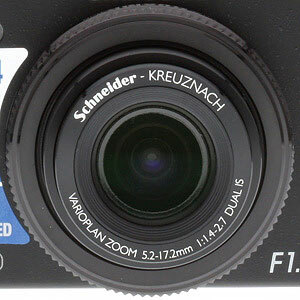 The new sensor lies behind a Schneider Kreuznach Varioplan-branded 3.3x optical zoom lens which starts at the same 24mm equivalent focal length at full wide-angle, but extends a bit more at the telephoto end, from 72mm to 80mm equivalent. Despite the increase in zoom ratio, maximum aperture has increased from an already fast f/1.8 to a very fast f/1.4, an improvement of two-thirds of a stop, making the Samsung EX2F's lens one of the brightest of any compact camera on the market. What's more, maximum aperture remains quite fast across the zoom range, only falling to f/2.7 at full telephoto. The EX2F also includes Samsung's Dual Image Stabilization technology, which couples both true optical image stabilization, and software-based anti blur techniques. The Samsung EX2F's relatively large (for a compact) image sensor in concert with its image processor combine to offer ISO sensitivities from 80 to 3,200 equivalents, with extensions to 6,400 and 12,800 (though the latter is at reduced resolution). As you'd expect of a camera aimed at enthusiasts, the EX2F sports not just aperture- and shutter-priority auto shooting, but also a fully manual mode that allows the photographer to control both variables. For those times when you just want a quick snapshot, the EX2F also offers Samsung's Smart Auto exposure mode, which works with both still image and video shooting. Video capability has also improved dramatically, from VGA resolution with mono sound, to Full HD (1,920 x 1,080 pixels) with stereo sound, captured with H.264 compression at a frame rate of 30 fps. 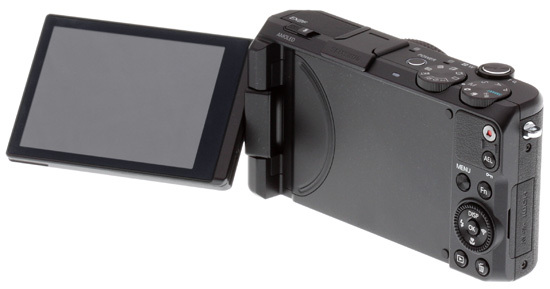 High speed video modes up to 480 fps at 192 x 144 pixels are also available. Support for SDXC cards has been added as well. Like its predecessor, the Samsung EX2F still offers RAW still capture support, for when the maximum versatility in post-capture processing is desired. Design. The EX2F is a handsome camera. It doesn't have the retro good looks of the Fujifilm X10 with its leather-textured body, but photographers tend to look through the lens rather than at the camera. The matte black surface of the magnesium alloy body discourages reflections (even if the small eyelets are chrome). Measuring just 4.4 x 2.4 x 1.1 inches (112 x 62 x 29 mm), I was able to slip the EX2F in my front jeans pocket during a warm weather spell but most of the time I carried it in a jacket pocket. It's a bit heavy for a shirt pocket. Hardware tour. From the front, it's all business. The large glass lens (compared to the contact lens-sized optics of most digicams) dominates the front panel. Its knurled ring is removable so you can screw on conversion lenses. And a telephoto conversion lens would be a smart idea while you're out shopping. Unlike a lot of small cameras, though, the EX2F includes an actual grip. Not a bar, not a bump, but a real grip for your right hand. You won't need to get a third-party grip to make it easier to hold. The grip has a secret, too. At the top end of the ridge there's a Command dial. I didn't even know it was there for a few days. But then I was on the other side of the camera. The Command dial is a real treat that often comes in handy and makes the camera a lot more usable than relying on the Scroll wheel to handle everything. What's more, it has an integrated button. Pressing it and then rotating the dial adjusts exposure compensation in shooting modes. It was a pleasant surprise to find it. Finally on the front is the Autofocus assist/Timer lamp. You can turn it off in the menu system. You'll notice (with some relief) that Samsung didn't try to squeeze a flash onto the front panel. On similar Samsung models, you'll find one between the grip and the lens. This lens is so big there just isn't enough room left. Instead, the flash pops up from the left side of the top panel. A small release sits right behind it. And you just push the flash back down to dispense with it. The accessory shoe (shown with cover here) is right next to the flash with the usual five contacts plus two more in front, which is what makes it a bit more than just a hot shoe. Continuing right along the top panel, two microphone holes sit on the front edge just in front of the Power button. That button can be hard to reach with a large strobe mounted. But it doesn't hurt to have it out of the way. It's flush to the surface of the panel but you can feel for it all the same. A blue LED surrounds it when the power is on. Behind that on the beveled back edge is a status lamp which comes in handy when the camera is busy writing RAW files. At the top of the grip, the Shutter button protrudes slightly, as it should, with the Zoom lever ringing it. Behind that are the Drive mode dial and the Mode dial, whose back edges are accessible thanks to that beveled back edge of the top panel. The Mode dial has Smart Auto, Program, Aperture Priority, Shutter Priority, Manual, Modes (which includes Scenes and special effects), Movie and WiFi options. 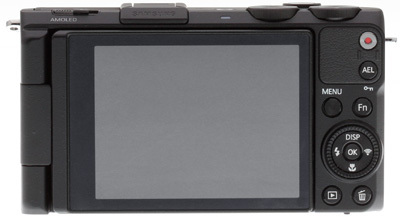 The Drive mode dial includes Single shot; 2-second shutter delay; 10-second shutter delay; Bracket; three continuous release modes marked H, M and L for up to 10 frames-per-second or high speed video; and a Pre-release mode that captures shots before the shutter is pressed all the way down. For my first shots with the camera, the Drive mode dial was set to the 10-second self-timer. I scratched my head a good long time looking for the timer control on the Scroll wheel before finding it on the dial. It's an unusual arrangement, but Samsung has enough drive modes on the camera to justify it. Still, if you're going to put another dial up there, how about ISO or EV? You're far more likely to change those from shot to shot than the drive mode. I found drive mode a surprising choice for that second dial. The left side of the camera has just the one strap eyelet (if you don't count the display hinge) and the right side has the other plus a small cover for the HDMI port and the USB/AV port. You'll need a fingernail to open the cover. On the bottom of the camera, the battery/card cover is hinged right next to the tripod mount (one of the few unphotographic features of the camera). The internal WiFi antenna is located under the lens on the bottom panel. Samsung recommends not contacting that part of the camera during transfers, so apparently you don't want to sit the camera down. I actually held the camera in my hands to watch the screen for my transfers, so it wasn't an issue. On the back, that big 3.0-inch, 640x480 AMOLED display with 614K dots takes up almost everything. AMOLED stands for active-matrix organic light-emitting diode, the technology behind the screen. It requires less battery power than an LCD because it doesn't use current to display black (there's no backlight). 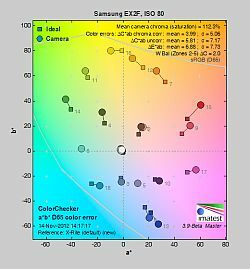 There is some color variation between LCD and AMOLED technology, and AMOLED screens, which can be brighter than LCDs, also age more rapidly than LCDs. Samsung has used AMOLED technology in its smartphones for some time now. I was able to see the OLED display clearly in direct sun but, as is the case with LCDs, it wasn't a reliable guide to judge exposure. You can face the screen toward the camera, protecting it when in storage or traveling and open it, rotate it and flip it back against the camera pointing out to use it like any other monitor. Plus you have all those angles in between to work with, so you can get a good view of the scene while holding the camera low or high or even pointing it to one side or the other. There is a thumb pad on the top right corner of the back panel but it's a small one. 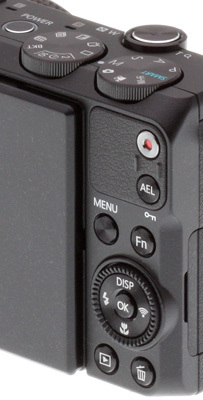 On its right side are two buttons: the Movie record button and the AEL button to lock exposure. The Movie record button requires a little explanation. It's the only way to start or stop movie recording, even though there is a Movie mode on the Mode dial. And you don't have to be in Movie mode to use the Movie button. Some other shooting modes allow you use the Movie button, too. If you try to use the Shutter button with the Mode dial on Movie mode, you'll just capture a still. If you are recording a movie, you can indeed press the Shutter button to record a still. Beneath the thumb pad there are two buttons: the Menu button to get into the camera's menu system and the Fn button to display and change recording settings all on one screen. Below the Scroll wheel with four functions and its OK button, sit the Playback button (it isn't on the Mode dial even though WiFi is) and the Delete button. Now about that Scroll wheel. Only two of the arrow positions are set to familiar controls. Left cycles through Flash modes and Down goes through the Focus modes. Up handles the Display modes (which isn't all that unusual but tends to reside on a separate button, leaving up free for ISO). And the Right arrow is reserved for what Samsung calls Smart Link, which launches a preset WiFi function. We can understand why, with the Fn button accessing ISO, Samsung decided to use Up for Display. But we had no end of trouble with the Smart Link button. The first problem is that the dial is right on the edge of the camera, so it is very easy to accidentally press the Right arrow when handling the camera. The second problem is the button brings up the WiFi dialog so I would often be interrupted by a message on the display asking me to pick a service to send my images. It took a while to realize the culprit was the Right arrow. Lens. The most interesting thing about the EX2F is its fast Schneider-Kreuznach lens. On a digicam, the lens is the camera, you don't get to swap it out. And having an f/1.4 aperture available in addition to Samsung's optical image stabilization opens a world of imaging closed to many other cameras. At wide angle, apertures range from f/1.4 to f/7.7. At telephoto, the range is from f/2.7 to f/8.5, controlled by the Scroll wheel in Aperture Priority and Manual modes. The one catch here is that with the zoom lens, you have to use a focal length of 24mm (35mm equivalent) to tap into f/1.4. That's a pretty generous wide angle. And if you want to do any macro work with it, you'll be so close to your subject (and yet not seem close enough) that it will be hard to compose the image. Focal lengths run from that 24mm through 80mm in 35mm equivalents, which is not much beyond normal, although just in the range suitable for portraiture. Without a telephoto conversion lens, it's hard to recommend the EX2F as a travel camera. Except I think it really does a nice job with digital zoom, extending the range 4x to about 320mm. 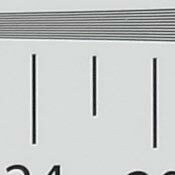 Oddly enough the Exif header reports that digital zoom ratio as 4.6, exceeding the spec. And that wasn't Samsung's 1.33x Smart Zoom mode. Take a look at our Twin Peaks zoom series (further below) to see for yourself. Digital zoom was a very pleasant surprise to me. Samsung notes the EX2F features Dual Image Stabilization, which is simply its optical image stabilization and digital image stabilization, tweaks exposure options to minimize blurring (increasing, for example, the ISO). You can turn off both (for tripod-mounted shots), enable just the optical or enable both with a Menu setting. Shutter speeds are as fast as 1/4000 second at f/3.9 or smaller. At larger apertures, it's limited to 1/2000 second. In Smart Auto, the slowest speed is 1/8 second but Manual mode offers 30 second exposures. Much as I appreciated the f/1.4 aperture and generous 24mm equivalent wide angle, I was frustrated with the limited reach of the 80mm equivalent telephoto end. Modes. The EX2F has a few surprises on its Mode dial, too. PASM isn't four of them, but it certainly distinguishes the camera's appeal from most digicams. And both Smart Auto and Movie mode are indispensable these days. But instead of the usual Scene mode, there's a Mode screen with a number of intriguing options. And then there's that WiFi mode you won't find on many cameras. Let's look at each of them a bit more closely. SMART AUTO. The EX2F analyzes the scene before it to optimize camera settings before exposure. An icon is displayed on the monitor to indicate what the camera is up to. The list of things you no longer have to worry about it interesting in itself. It includes (in Samsung's terminology, for the most part) Landscapes, Scene with bright white backgrounds, Landscapes at night without flash, Portraits at night, Landscape with backlighting, Portraits with backlighting, Portraits, Close-up photos of objects, Close-up photos of text, Sunsets, Blue skies, Forested areas, Close-up photos of colorful subjects, Camera on tripod, Moving subjects, Fireworks on tripod, Dark interior, Partially lit, Close-up with spot lighting, and Portraits with spot lighting. PROGRAM. Program mode has the endearing quality of enabling most camera functions for you to fiddle with as the camera itself sets shutter speed and aperture. To my surprise, however, this photographer-centric camera won't let you scroll through a set of equivalent shutter speed/aperture combinations in Program mode. (Commonly called program shift or flexible program.) The camera picks just one and that's it. I would have liked to scroll to a wider aperture option, especially with an f/1.4 lens, but no sale. APERTURE PRIORITY. Using the Scroll wheel, you pick the aperture (which is more fun with the EX2F's f/1.4 lens than on most cameras) and the camera sets the shutter speed. SHUTTER PRIORITY. Using the Front wheel (on the grip), you pick the shutter speed and the camera sets the aperture. MANUAL. 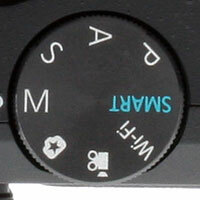 Use the Scroll wheel to set the aperture and the Front wheel to set the shutter speed. Don't forget about ISO, either. It's the third leg of the exposure tripod. Scene is your doorway to the EX2F's Scene modes. They include Beauty Shot (to hide facial imperfections), Night, Landscape, Text, Sunset, Dawn, Backlight, Beach & Snow, and 3D Photo (you'll need a 3D TV to see the MPO file). Several of these are handled by Smart Auto, which would seem the more intelligent approach. Panorama sets the camera to do a very nice sweep panorama. I was impressed (yes, you could say pleasantly surprised) with how easy it was to use and how well it accommodated a short or slow sweep. It's really the best implementation I've tried. Magic Frame adds a cartoonish frame effect to your image. Split Shot composites several exposures into one layout. Picture in Picture composites a background capture with an inset exposure or movie. Artistic Brush converts a 5MP image into an Ink Painting, Cartoon or Sketch, showing the conversion as a movie right after capture. I think. I tried it several times and am still not sure what the point is. The converted image and the animation are both saved to the card. HDR captures two images at different exposures, overlaying the highlights of the underexposed photo on the shadows of the overexposed photo to extend the tonal range of the image beyond what you can capture in a single shot. Creative Movie Maker compiles a movie from stills or movie clips. Full HD Movie. 1,920 x 1,080 at 30 frames per second. MOVIE. In Movie mode, a smart scene detection function can optimize settings for Landscape, Blue Sky, Natural Green, and Sunset. The EX2F records in MP4 format (Video: MPEG-4 AVC/H.264, Audio: Stereo AAC) with a maximum clip time of 20 minutes at 1920 x 1080, 1280 x 720, 640 x 480 and 320 x 240, all at 30 frames per second. Available frame rates include three high-speed options (480 fps at 192 x 144, 240 fps at 384 x 288, and 120 fps at 640 x 480). The high-speed options require the Dial mode be set to Movie mode so the Drive mode option for H (480 fps), M (240 fps), or L (120 fps) can be set. High-speed Movie. 192 x 144 pixels at 480 frames per second. Filters, which are not available for high speed video, include Palette Effect 1, Palette Effect 2, Palette Effect 3, Palette Effect 4, Miniature, Vignetting, Half Tone Dot, Sketch, Fish Eye, Classic, and Retro. Optical zoom and optical image stabilization are available during recording. In addition, you can tap the OK button to pause during recording and playback, capture still images during recording by pressing the Shutter button, and trim clips. Remember, though, to use the Movie record button and not the Shutter button to start and stop movie recording. The EX2F user manual doesn't state minimum card speed, just to use cards with faster write speeds when recording HD or high-speed movies. From the bitrates we've seen in the EX2F's Full HD movies, Class 6 should be plenty fast, though Class 10 wouldn't hurt either. MobileLink sends your captures to a smartphone (Android or iOS app). Remote Viewfinder uses a smartphone as a remote shutter release with a preview on the phone of what the camera sees (Android or iOS app). Social Sharing transmits photos or videos to a file sharing website, such as Facebook, Picasa, YouTube and Photobucket. Email sends a capture to an email address. Cloud uploads to a cloud service. Currently only Microsoft's SkyDrive is supported. TV Link enables display of EX2F images and movies on a TV Link-enabled TV from the camera. Menu System. Samsung uses two menu systems on the EX2F, like many other manufacturers. In this scheme, the Menu button provides access to all the functions grouped under tabs by type while a second button brings up a one-screen menu of the most common shooting options. The Menu system includes Still, Movie and Setup tabs in Record mode. In Playback mode, the tabs are WiFi, Edit functions, Slide Show, Card management, and Setup. The Fn button brings up the one-screen shooting menu in Record mode but does nothing in Playback mode. With Program mode active, the screen shows windows for the EV and ISO settings above three rows and four columns of icons for other functions: Photo Size, Quality, Metering, WB, Face Detection, Focus, Focus Area, Smart Filter, ND Filter, OIS, and Flash. As you scroll through them with the Scroll Wheel, they are identified by text at the top of the screen which also shows the current setting. Pausing on the icon for a bit also brings up a help balloon to explain what the function does. It's a pleasant arrangement to view but I found it difficult to navigate. I always confused the navigation control for moving around the screen with controls for changing the settings. In the end, I would have preferred a more direct way to set ISO at least. Connectivity. In addition to Wi-Fi, connectivity includes a Micro (Type D) HDMI 1.4 port for high-definition viewing with Anynet+ (HDMI-CEC) support, and a Micro B USB port for combined standard-def AV/USB 2.0 connectivity. The battery is also charged via the USB port (when the host can provide 500mA at 5V). Storage & Battery. The EX2F supports Secure Digital, Secure Digital High Capacity, Secure Digital eXtended Capacity, microSD, microSDHC, and microSDXC memory cards. 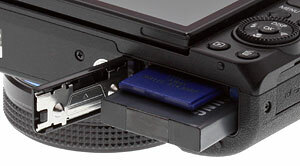 An adapter is required for microSD cards. Samsung estimates about 277 12MP Super Fine images will fit on a 2GB card. That same card will hold 51 RAW+JPEG at the highest quality setting. And it will also store about 19 minutes of Full HD video at 30 fps. File sizes are large. The JPEGs in the Gallery ranged from 1.5MB to 7.3MB but most were over 3MB. And the Raw files were significantly larger, ranging from 28.3MB to 32.8MB but most over 30MB. Power is supplied by a 3.7 volt, 1,030 mAh, SLB-10A lithium-ion battery. The battery is charged in the camera with the included AC adapter and USB cable. A separate battery charger is available as an option. Samsung does not report CIPA figures for battery life, preferring "Samsung standards" (detailed in the manual). Those standards look similar to CIPA, though, and indicate about 260 photos or 130 minutes of movie recording per charge. I found a charge to be more than ample for my typical expeditions. But I didn't to tap into the WiFi features much. The EX2F is about as compact a camera as I'm comfortable with. It's bigger than a deck of cards, certainly, but it fits the hand comfortably and can be dropped into a pocket, leaving the camera bag at home. And yet it has room for some of the niceties that make taking photos enjoyable. Like that articulated display, the hot shoe, and that fast lens. Zoom Range. 24mm to 80mm to 4x digital zoom. I hiked up Twin Peaks with the camera and took the zoom series shots. I was more than a little skeptical about the 3.3x optical zoom range and wasn't impressed by the first two shots. But the third surprised me. The EX2F handled digital zoom exceptionally well compared to other models I've used. I quickly convinced myself not to worry about stepping over the line into digital zoom. Getting the right settings. Although my first shots were landscapes, I was anxious to take some street shots with it. And I would have slipped it into black and white mode if I'd been able to figure out how to do that by looking at the camera. I did find the Saturation control and cranked it down all the way but that didn't eliminate color. It's just a tweak -- not a full control. To shoot monochrome you have to enable the Classic Filter. Surprise. Sometimes you really miss Fujifilm's straightforward emulsion emulations. And this was one time. 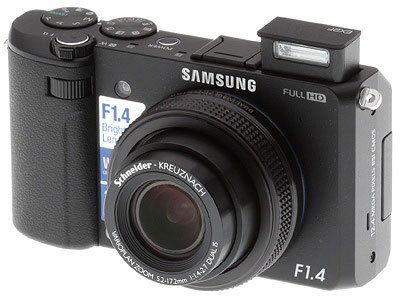 I wish Samsung had hired away Fujifilm's guy. But I did get some street shooting in, and of the best kind, a crowd assembling for the first game of the 2012 World Series. The last thing you want to do when street shooting is fiddle with camera settings. That's one reason a wide-angle lens is preferred. It focuses from a few inches away to infinity so focus isn't critical. And with ISO cranked up, you don't have to worry about camera movement either. But I did have one worry. Aspect ratio. The EX2F offers several: 4:3, 3:2, 16:9, and 1:1. Unfortunately Samsung doesn't identify them that way. Instead, the Photo Size options are spelled out solely in pixels. That's a reason to wish they'd hired away the Panasonic guy who put an aspect ratio switch on the lens. It's a lot of fun -- creative fun -- to switch among aspect ratios during a shoot. But it was a chore on the EX2F. A chore I undertook anyway because it's worth it, after all. RAW capture is good, but... I got back to the bunker with about half an hour to post a few shots. The JPEGs weren't usable, so I processed everything in Lightroom, which applied the JPEG crops to the RAW files. I posted a short news story with a small selection of the images. Nobody in their right mind would do event photography on a deadline with a camera whose JPEGs they can't trust. It just isn't feasible to add to the workflow. I was lucky to be able to work fast enough to get the TV on with the sound down and the Giants' broadcasters on the radio just a couple of heartbeats before the first pitch of Game One. I also took the EX2F and an Olympus E-PL1 to the de Young Museum to shoot a selection of artwork in the Paley exhibit. The E-PL1 had no trouble with the kit lens delivering distortion-free images. Not so with the EX2F, though. Some setup issues. There were some setup issues to contend with. Turning off the rather loud camera sounds was first. I hadn't noticed them when I was shooting 900 feet above sea level or in the crowd at the stadium, but in the quiet rooms of the exhibit they drew attention to themselves. The autofocus assist lamp was another. It cast a disturbing orange target on the artworks, which I was sure would attract a guard. Why didn't anyone else's camera do that? I wondered. They must have. But the EX2F's lamp is not unobtrusive. I did get focus errors without the assist, though. The ambient light was just too low for the EX2F. Auto tendencies. I shot with the EX2F for a bit longer than two weeks. During that time, I took 128 shots of which only six were at f/1.4. The most popular aperture was f/4.2 at 26 and f/4.1 at 11. Nothing else broke into double figures but f/3.6 scored 9, f/3.9 had 8 and f/3.5 had 7. At the small end of the settings, f/8.5 had 5. So what you can take from this is that the lens is so wide, you won't be at f/1.4 much, spending more of your time around f/3.0. The EX2F's Auto ISO favors ISO 80 (83 shots) with ISO 400 coming in second (31) and the rest scattered in the single digits. So there's not a lot of ISO shifting going on. Shutter speeds were evenly distributed through the range, suggesting the EX2F relies on shutter speed to fine tune exposure. J-PEG'd into a corner. The EX2F's JPEG rendering left much to be desired for many shots. Image quality. I captured some stunning shots with the EX2F. But very early on I realized I couldn't rely on its JPEG rendering. So I almost never shot JPEG only. This is the only camera that has ever pushed me into that corner. But it didn't take longer than the first outing up Twin Peaks under a dramatic post-storm sky. I had set the camera to RAW+JPEG, noticed happily that the delay in writing the RAW wasn't going to hamper my style (but there is a delay, so it might hamper yours), and left it that way. Looking at my shots on the AMOLED display, I liked what I was getting. But when I returned to the bunker and brought them up on the monitor, I was a little horrified. Well, OK, maybe "surprised" is a better word. The shadows were plugged up, the highlights blown. On the JPEGs. But the RAW images rendered very nicely in Adobe Camera Raw. It was almost as if there were two cameras in the EX2F. So if there's an image I shot for this review in the Gallery interests you, download the RAW version to see what the EX2F is really capable of. You might be shocked (not just surprised) at what YSAM_0026.SRW looks like compared to YSAM_0026.JPG. High contrast scenes saved as JPEGs in the camera weren't usable but the RAW captures had a lot of life in them. It was such a dramatic difference, we shot RAW+JPEG almost all the time. Not all JPEGs are as bad as my first ones. Those scenes had high contrast. With more moderate contrast in the scene, the JPEG won't exhibit blown highlights and plugged up shadows. But it's too bad the EX2F doesn't include something like Canon's iContrast, Nikon's D-Lighting or even Samsung's own Smart Range found in the NX series to enhance JPEG rendering. Image analysis is performed on JPEGs, so I won't have as much to say on that subject as usual. The Resolution Target shows no chromatic aberration in the corners while resolving about 2,000 to 2,100 lines of resolution. Really very nice. The ISO 80 Still Life was quite sharp throughout and holds highlights well. The wide-open Wide-Angle Target shows soft corners as well as noticeable barrel distortion while the Telephoto Target shows surprisingly soft corners and significant pincushion distortion. WiFi capabilities. The Samsung EX2F supports MobileLink, Remote Viewfinder, Social Sharing, Email, Cloud (specifically Microsoft's SkyDrive), Auto Backup and TV Link modes. There's also a Wi-Fi Direct option for copying files manually to a supported device. We've reviewed other Samsung cameras, including recently the NX20, which boasted advanced WiFi features but we've always been a bit underwhelmed -- even though Samsung's cameras handle WiFi connectivity better than most. What's new is that Samsung recently released its MobileLink and Remote Viewfinder apps for Apple iOS, and they seem to operate similarly to how they work on Android devices. MobileLink allowed me to sync up my photos between the Samsung EX2F and my iPhone very easily, creating a small network between just the two devices. I didn't have to log into the office's network, which is a somewhat painstaking process that you need for sharing your images and videos on Facebook, YouTube and other social sites, as we detailed in our Samsung NX20 review. That said, I couldn't get the Remote Viewfinder app for iOS to work at all, even though I had successfully set up the 1:1 (camera to iPhone) network just minutes before when using the MobileLink app. Recent negative reviews of the Remote Viewfinder app seem to indicate that I wasn't the only one to have such a problem. In any case, hopefully it's a bug that's quickly fixed, as the Remote Viewfinder app for Android worked just fine. Again, while we think the WiFi capabilities of the Samsung EX2F are a little better than most cameras, it's still a little clunky to use -- nowhere as seamless as it is to take and share photos with an Android phone or iPhone -- and we're still looking for manufacturers to bridge the gap quickly. For more detailed test results, visit the Optics page. Sharpness: The wide-angle end of the Samsung EX2F's zoom shows some noticeable blurring in the corners of the frame compared to what we see at center at maximum aperture, and blurring is a little stronger in the right corners than left (though it doesn't extend far into the image area). At telephoto and maximum aperture, blurring is strongest in the upper corners, with better results in the lower corners. At both zoom settings, details in the center of the frame are quite sharp. Corner sharpness improves when stopped down, though some corners are still soft, particularly at telephoto. Geometric Distortion: There is slightly below average barrel distortion at wide angle (0.5%), though slightly higher than average pincushion distortion at telephoto (0.5%). Results are good, though noticeable in some images. Uncorrected RAW files show much higher barrel distortion (2.8%) at wide angle, but about the same pincushion (0.5%) at telephoto. Chromatic Aberration: Chromatic aberration in the corners at wide angle is moderate in terms of pixel count, though pixels are quite dull with a faint red tint. Telephoto, however, shows far less noticeable distortion, with mere suggestions of a reddish tint along the target line. Uncorrected RAW files show much higher and brighter chromatic aberration. Macro: The Samsung EX2F's Macro mode captures a very sharp image with strong detail, particularly in the center of the frame, though corners are soft (a common limitation among consumer digital cameras in macro mode). 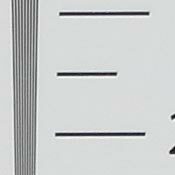 Minimum coverage area is smaller than average at 1.15 x 0.86 inches (29 x 22mm), which is quite good. The camera's flash is partially blocked by the lens at this range, which results in dim exposure with a strong hot spot in the top left. Thus, external lighting will be your best bet when shooting this close. Viewfinder Accuracy: The Samsung EX2F's OLED monitor showed just over 99% coverage at wide angle, and just over 100% coverage at telephoto. Very good results here, especially given the distortion correction at wide angle. For more detailed test results, visit the Image Quality page. Color: The Samsung EX2F produces good overall color at base ISO, with bright saturation levels overall. Reds are pumped a little high, and greens, blues, purples and browns also show slight boosts in saturation, but performance here is good. 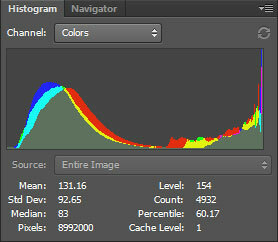 Mean saturation is 112.3%, or 12.3% oversaturated, which is just slightly higher than average. 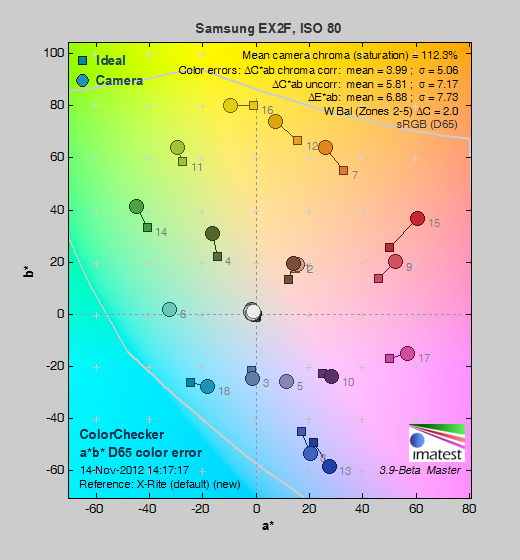 In terms of hue, the EX2F pushes orange toward yellow and yellow toward green, but most hues are about accurate. Mean "delta-C" color error after correcting for saturation is excellent, at only 3.99; much better than average. Lighter skin tones show a nudge toward orange, as do darker skin tones, but results are still good. Incandescent: Manual white balance handled our incandescent lighting best overall, with the most natural color. Auto produced a strong red cast, while the Incandescent setting resulted in a strong warm cast. Resolution: Our laboratory resolution chart revealed sharp, distinct line patterns down to about 2,100 lines per picture height horizontally and about 2,000 lines vertically. Extinction of the pattern occurred after 2,800 lines per picture height. Flash: Our manufacturer-specified testing (shown at right) doesn't work well at wide angle when the reported distance goes beyond 16 feet, because that takes the camera out of the main lab, so the wide-angle result is inconclusive at 25.6 feet. (The target is dimly illuminated, but the close, white wall sometimes tricks the exposure system even though spot metering was used.) The telephoto test target came out bright at 13.5 feet, though ISO was boosted to 400. Auto flash produced bright results in our indoor portrait scene, retaining a hint of the ambient light despite a quick shutter speed of 1/60 second at ISO 160. Good results here, helped by the relatively fast f/2.7 aperture the camera selected for this shot. Shot taken at ~5 feet (~1.5m) on a stable tripod. ISO: Noise and Detail: Detail remains strong and well defined at the lower ISO settings, though a small amount of softening is present at ISO 80. By ISO 400, stronger evidence of chroma (color) noise becomes noticeable in the shadows, but ISO 800 is where detail loss becomes most noticeable. Noise reduction efforts also begin to interfere with detail here, and progressively get worse as ISO increases. The effects are so strong that images at ISO 12,800 are reduced to 1,984 x 1,488 pixels. See Printed results below for more on how this affects prints. Printed: Good 13 x 19-inch prints from ISOs 80 and 100; ISO 800 prints look good at 5 x 7; ISO 12,800 images do not make a usable print. ISO 80/100 prints look good at 13 x 19 inches, but are a little soft for printing at 16 x 20. ISO 200 prints are soft but usable at 13 x 19 inches, but we prefer the 11 x 14-inch prints. 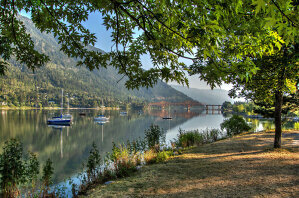 ISO 400 images also make a good 8 x 10 inch print, and an 11 x 14 suitable for wall display. ISO 800 prints are good at 5 x 7 inches, with 8 x 10's usable for certain purposes but soft and show noise in the shadows. ISO 1,600 prints a good 4 x 6, and a usable 5 x 7. ISO 3,200 prints a usable but grainy 4 x 6. ISO 6,400 prints are very rough at 4 x 6. ISO 12,800 are too blurry and noisy at 4 x 6; this ISO setting is best avoided. The Samsung EX2F does fairly well given its 12MP 1/1.7" sensor, but print quality fades rather quickly as ISO rises. For more detailed test results, visit the Performance page. Startup Time: The Samsung EX2F takes about 1.7 seconds to power on and take a shot. That's about average for its class. Shutter Lag: Full autofocus shutter lag is good at 0.38 second using Center AF mode, increasing slightly to 0.41 in Wide Area AF mode. Prefocused shutter lag is 0.13 second. Definitely not the fastest out there, but still pretty quick. Cycle Time: Cycle time is also just okay, capturing a frame every 1.2 seconds in single-shot mode for Super Fine JPEGs. 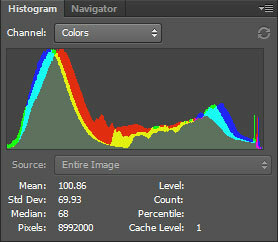 This increases to 1.8 seconds for RAW, but oddly increases less to 1.5 seconds for RAW+JPEG. A high-speed continuous mode captures 10.2 frames per second for 9 JPEGs, which is quite fast. Continuous mode is not supported with RAW files. Flash Recycle: The Samsung EX2F's flash recycles in about 5.3 seconds after a full-power discharge, which is fair. Low Light AF: The camera's AF system was able to focus down to below the 1/16 foot-candle light level without AF assist enabled, and in complete darkness with the AF assist lamp enabled. Excellent performance here, but we noticed the camera seemed to misfocus more often than average during our low light testing. USB Transfer Speed: Connected to a computer or printer with USB 2.0, the Samsung EX2F's download speeds are reasonably fast. We measured 6,463 KBytes/sec. Battery Life: The Samsung EX2F's battery life has a CIPA rating of 260 shots per charge, which is a little below average. No AV or HDMI cable is provided. The provided software includes a RAW conversion utility but the current implementations of Adobe Camera Raw handle Samsung's RAW format without a problem. Large capacity SDHC/SDXC memory card. These days, 8GB is a good tradeoff between cost and capacity, but if you plan to capture HD movie clips, look for larger cards with Class 6 or faster ratings. Samsung is unusual in that it designs both smartphones and cameras. That means it knows what a smartphone can do and what a camera can do and, equally important, what each of them can't do very well. Samsung has no doubt made its mark in the smartphone arena, and it is still making in-roads with cameras. That said, the latest generation of cameras from the company have been very good -- especially its NX line of compact system/mirrorless cameras (CSCs). The Samsung EX2F is a solid effort in creating a premium compact camera that boasts some advanced imaging and creative features for more serious photographers. But otherwise, as a premium compact camera, the Samsung EX2F performs pretty well, with some not-insignificant quibbles. While the f/1.4 Schneider-Kreuznach lens is one of the fastest digicam lenses on the market, it's not without its shortcomings, and the images it captures are limited by the EX2F's processor. The camera's advanced controls and RAW capture capabilities are what enthusiasts look for in a compact camera, but inconsistent JPEGs could force more time (and resources) processing RAW images than many photographers would like to with their carry-around camera. That said, we feel the Samsung EX2F stacks up with many of the best compact cameras in its class, and as long as you don't mind shooting RAW, we recommend it as a Dave's Pick.